Having a reputation of meeting schedule constraints and finding cost-savings, SJCA can complete any roadway project successfully. 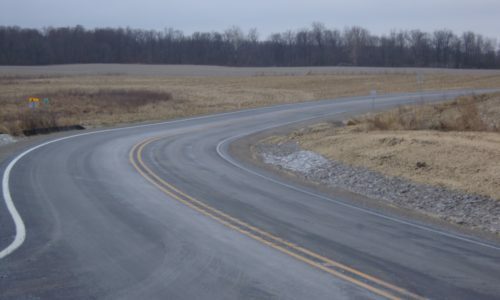 Our team of licensed professional engineers have completed many new roadway designs, roadway replacements and rehabilitations, traffic control plans, roundabouts and small structure replacement. This project included reconstruction of the existing stop controlled intersection at Carey Road and Hawthorne Drive with a single lane roundabout. The existing Hawthorne Drive typical section consisted of a single eastbound and westbound lane separated by a ten foot wide landscaped median. 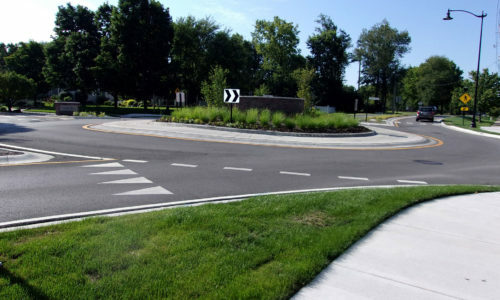 The new Hawthorn Drive approaches were designed to match this existing section and minimized the street reconstruction to within 100 feet each side of the roundabout. Carey Road reconstruction extended 225 feet south and 325 feet north of the roundabout to provide the appropriate islands and lane delineations. Curb and gutter construction with an enclosed drainage system was designed for the project. The design also included signing, pavement marking and street lighting. The construction cost was $630,000. This project consisted of a complete realignment of SR 327 to eliminate two sharp horizontal curves forming ninety degree junctions at each end of the project. The majority of the alignment is on new terrain with two new intersections included at the north end and south ends of the project to tie in the old alignment. A portion of the existing pavement was removed and cul-de-sac included at the south end of the existing alignment. The project also included intersections at CR 34. Intersection at CR 36 was converted to a right turn only intersection. As a result of the realignment, a new small structure consisting of an 18’ span by 4’ rise box culvert was required at the crossing of UNT John Diehl Drain. 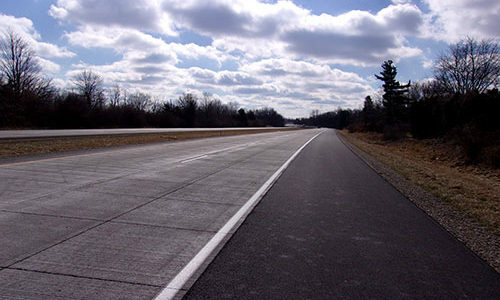 SJCA provided roadway design of a concrete overlay also known as “white topping” in Henry County and Delaware County. The deisng and construction consisted of milling the existing HMA surface from the existing composite pavement and resurfacing with a 4.5” thick Portland Cement Concrete Overlay within the driving lanes. The shoulders were milled and resurfaced with an HMA overlay. There were four paving exceptions within the project at existing bridges. Traffic was maintained on SR 3 throughout construction and the plans included phasing information and a layout for construction warning signs. The construction cost for this project was approximately $16,000,000.